‘I think we have an extraordinary landscape here waiting to be discovered by millions,’ says landscape architect Kathryn Moore, unrolling a jauntily coloured map of her visionary new park in a Birmingham City University office. The professor isn’t talking about of Cumbria, Umbria, Snowdonia or Amazonia. 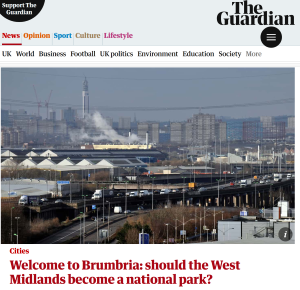 She’s talking about the touristic potential of the West Midlands plateau, the heart of England that threw itself into the fiery crucible of the Industrial Revolution and still bears sacrificial scars. It is here that Professor Moore wants to create the United Kingdom’s 16th national park. In the 19th century, Queen Victoria would lower the blinds on the royal train so she didn’t have to see the smokestack hell of the Black Country. Tolkien was inspired to create Mordor from nocturnal visions of its blast furnaces. If Moore has her way, though, in a decade or so Queen Kate will raise the blinds as the HS2 train passes the reconfigured Tame Valley between Birmingham and Coventry. ‘Look!’ she’ll exclaim to King William. ‘What a vista of allotments, fisheries, fields, orchards, forests, hi-tech agriculture, green industries, creative hubs and cycle paths!’ She’ll gaze in admiration at how the Tame has been rerouted using water from Birmingham city centre’s aquifer, all crisscrossed by new footbridges linking together suburbs long isolated by the city’s motorised arterial routes.